Just as through the Cross, joy has come into the world. So through our humility and our repentance, joy comes into our lives. And these two mysteries, the great mystery of salvation in Christ and the little mystery of our soul finding its way are deeply embedded one in the other. In truth, His death for our sakes becomes our death to sin and corruption. His resurrection for our sakes becomes our resurrection unto eternal life so that when the Eternal Father gazes upon creation He sees the in us figure of His Eternal Son who died and rose from the dead. The dread events in the Holy city of Jerusalem at the time of Pontius Pilate and our own lives are forever connected through the mystery of Baptism. We are submerged in the Radiant Waters of holy baptism and mystically buried with Christ. 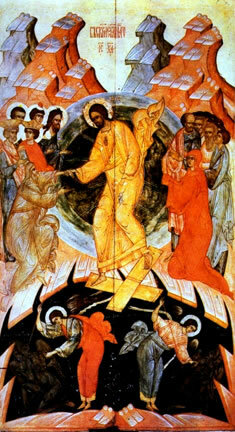 Our sin and mortality are left in the waters, as in a tomb, so that we may rise with Him to newness of life. This movement from death to life is no weak symbol or liturgical re-enactment, but a mystery apprehended by faith, apprehended by prayer, apprehended by those who have touched Christ, have put on Christ, and now have Christ living in them. In an earlier post on depression, I made some similar comments, “For the Christian, depression as a mindset is incompatible with the life of faith, for it expresses the conviction that our cross is only a cross, suffering and nothing more, that our loss is only a loss and not a possibility for grace-attracting kenosis, and that without our former world, without our ideal self-image, and without our this-worldly dreams, there is no point in moving forward, there is no goal worth pursuing, in a word, there is nothing to hope for.” For those who are baptized, our earthly sufferings are Christo-centric crosses that offer the path to resurrection in Christ. Our union with Him in holy baptism means that everything the world considers banal and base is life-giving and an opportunity to behold the resurrection of Christ in our own lives.